Information, materials, and services on this website are provided “as is” without warranty of any kind, including, but not limited to, the implied warranties of merchantability and fitness for a particular purpose, title, non-infringement, security, or accuracy, except as required by law. 1.1 Users agree that BPU and any other parties involved in creating and delivering this site's content have no liability for direct, indirect, incidental, punitive, or consequential damages with respect to the information or services contained on or otherwise accessed through this website. BPU does not endorse any third party websites or services. Links to third party websites are provided for information only. BPU is not responsible for privacy policies or content of third party websites. 1.2 Other than as required under applicable consumer protection law, under no circumstance will BPU be liable for any loss or damage caused by your reliance on information obtained through this site or a linked site or by your reliance on any product or service obtained from a linked site. 2.1 We use the personal information you provide to us only in connection with your request and do not share this information with parties outside of BPU unless necessary to complete your request, except that, if you are delinquent on your utility bill, we may share your personal information, including your Social Security number, with the State of Kansas and our 3rd party collection agency for the purpose of recovering the delinquent amount through the collection agency or the State’s setoff program, as provided by K.S.A. 75-6201 et seq. 2.2 If you supply your postal address online, you may receive periodic mailings from BPU. These mailings may include information on new programs, services, or upcoming events and news that may be of interest. 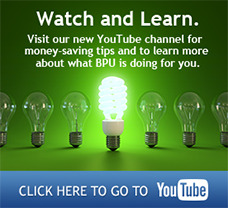 If you do not wish to receive such mailings from BPU, please let us know by sending an e-mail to publicaffairs@bpu.com. 2.3 If you supply your e-mail address online, we will use it only to answer e-mail received, unless otherwise stated. We do not share e-mail addresses with outside parties unless necessary to complete your request. When you visit bpu.com to browse or download documents, our Web server places a temporary session cookie on your computer to collect and store certain information about your visit. This information does not identify you personally. if you linked to bpu.com from another site, the URL of the referring website. 3.1 The above information is gathered and analyzed to keep us current with industry standards and to improve our website. Our website contains energy-related information that is of educational value to children. To the extent that children use our website, any information collected is not stored on the Web server. We encourage children and young teens to seek consent from their parents before providing any information to us. Our website provides data, information, and images that are copyrighted by BPU. No unauthorized use of copyrighted data, information, or images is permitted. BPU is the owner of and reserves all legal rights for the registered trademark BPU®. Additionally, we reserve all rights in the use of registered trademark logos. Express permission to use files from bpu.com may be granted to users who agree not to modify or alter the original file. Changes or modifications to these files are not permitted without the permission of BPU. All credits, notices, copyrights, and trademarks must remain intact within the file, unless noted otherwise. BPU will not be held liable with regards to downloaded files. Occasionally, bpu.com files are deleted, moved, or archived. The download, maintenance, and use of these files are the responsibility of the user. BPU may make improvements or changes to this site at any time. BPU grants permission for websites to link to the home page of this website or to any page within it. Third party links to bpu.com should be checked regularly in case a file or directory has been changed or moved since the link was created. Creating a link to bpu.com does not constitute an agreement that a reciprocal link be placed on bpu.com.